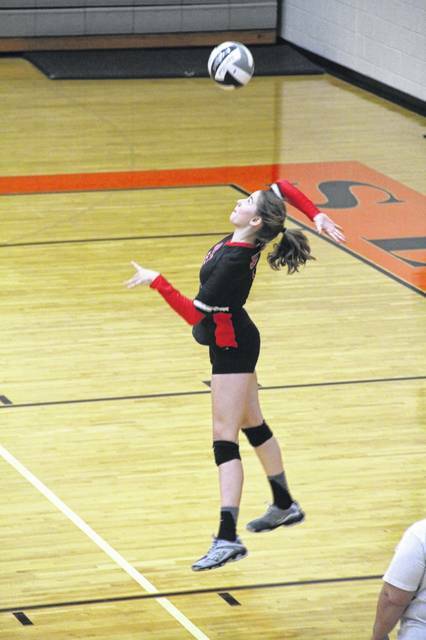 The South Webster Jeeps swept the Portsmouth West Senators in their match Wednesday evening, 3-0. The South Webster varsity volleyball team beat the Portsmouth West Senators Thursday night in three straight games by winning the first set 25-19, the second set 25-10, and the final set 25-23. The first set proved to be very close as both teams fought for every point. The Jeeps and The Senators would trade the lead throughout the set as both teams struggled to gain the advantage in the early going. West jumped out to an early 5-3 lead but couldn’t hold on to the serve as the Jeeps fought back to take a 9-7 lead going into the set’s first timeout. After the first timeout, both teams would continue to trade the lead until the Jeeps went on a five point run led by two Taylor Rawlins aces that stretched their lead to 21-14. South Webster finished the first set, winning 25-19. The Senators looked to take back the momentum as the second set began. The match continued to be close as both teams were tied 8-8. But the Jeeps found their rhythm again, going on a fourteen point run to push the score to 22-9. South Webster finished the second set in impressive fashion, winning it 25-10.